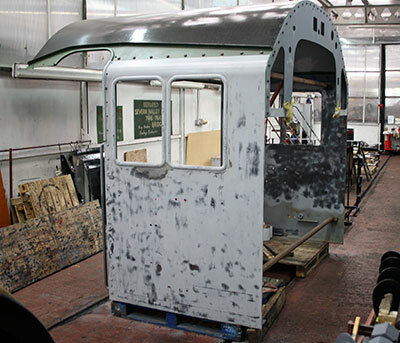 The cab is now in the paintshop at Bridgnorth and receiving the expert attention of Andy Williams and Gary Townley. The finished paint job is eagerly awaited. 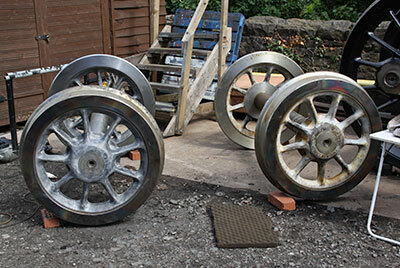 The pony wheels arrived at Bridgnorth recently and are being cleaned down and painted by our own team. 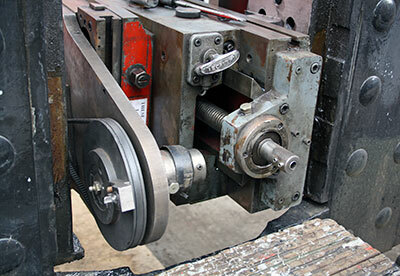 The horn facing machine on hire from the West Somerset Railway has seen some serious action since last month’s news update with the result that the horns for the centre driving wheels are now satisfactorily machined preparatory to fitting the manganese liners. The horns for the leading and trailing wheelsets have yet to be tackled. The hired machine is basically a fly cutter. The tool is mounted on a turntable driven by an electric motor whilst another low speed motor is attached to the end of the lead screw of the main table which slowly moves the rotating tool across the work surface. 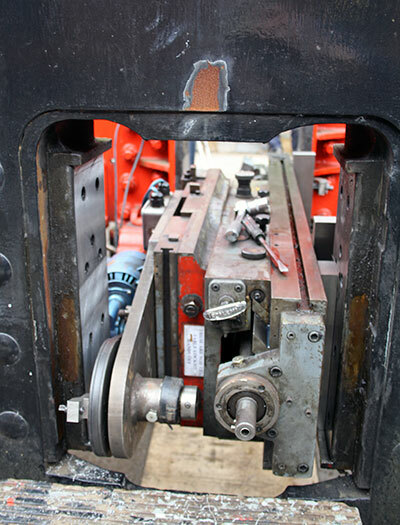 The secondary table of the machine can be rotated through 180 degrees to work on the horn on the other side of the loco once the first horn is finished without dismantling the whole machine and re-setting. There have been movements of boilers in and out of the boilershop recently which has resulted in 82045’s boiler being moved out of the way, but still inside and therefore difficult if not impossible to work on. Whilst the smokebox is on the ground some drilling of more holes has taken place. There are numerous holes to secure the wrapper to the saddle, holes for hand rail pillars, blower, vacuum ejector exhaust, chimney, to name but some of the more obvious ones. With the prize draw for the SVR Guarantee Company raffle about to take place, we were delighted to learn that this has been the most successful raffle held to date on the Railway: we should be in a position to give you more details next month. Also, an appeal to SVR shareholders has brought a very good response indeed, proving that there is still plenty of latent support out there for 82045, just waiting to be tapped. Thanks so much to all those who have organised and supported both the raffle and the appeal. As a result, our funds will be receiving a considerable boost. As I've written before, our finances remain very sound, but there is no possibility of becoming complacent: the rapid rate of progress on a number of fronts (not always obvious from what you see on the ground at Bridgnorth) means that our hard-pressed engineering team can no longer keep up with it all, so that some machining jobs have had to be contracted out. This is likely to be an increasing trend, as it is important that progress on building the loco should proceed with as much despatch as possible. This hasn't yet caused me any headaches, and I'm still keeping a miser's iron-hard grip on the purse strings, but it does mean that the need to plan ahead and anticipate expenditure will continue to be of the greatest importance. 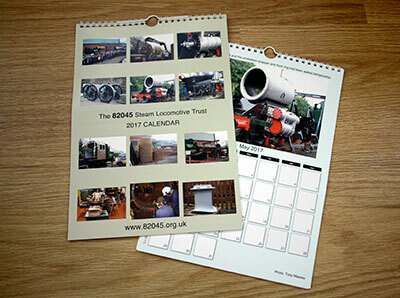 It may be mid summer but our new calendars have arrived and may be purchased from Barbara at a cost of £6.00 + £1.25 p&p. The new look calendar is in full colour and pictures various stages of 82045's construction. The cab in the Bridgnorth paintshop. Photo: Tony Massau. 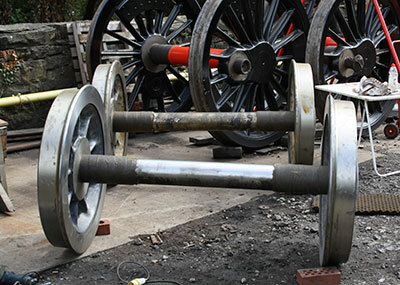 The two pony wheelsets safely delivered from the SDR. Photo: Tony Massau. The business end of the horn facing machine - the cutting tool mounted on a small turntable. Photo: Tony Massau. After the completion of a cut across a horn face. Photo: Tony Massau.